Use our attorney-drafted Pet Care Agreement to delineate the pet sitting services that the Pet Owner wishes the Pet Sitter to provide. The Basics: What is a Pet Care Agreement? 2. The Basics: What is a Pet Care Agreement? A Pet Care Agreement is a contract for pet sitting services between two parties – the Pet Owner and the Pet Sitter. When a Pet Owner needs someone to take care of their dog or cat, this agreement clearly spells out your pet’s normal routines and what is expected from the Pet Sitter. If your pet is older or has unique needs, this form can help Pet Sitters provide the right medication or special care. 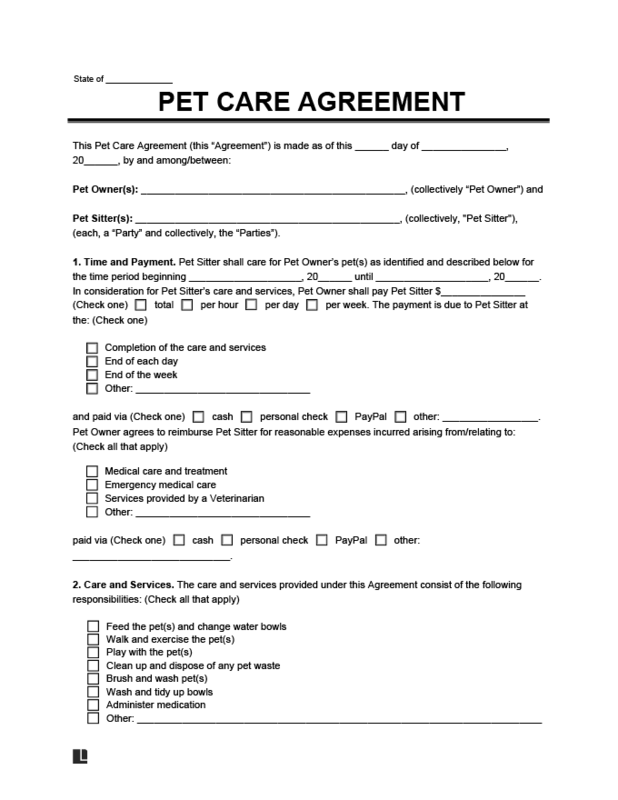 The sample pet care agreement below details an agreement between the pet owner, ‘Evelyn D Tulley’, and the pet sitter, ‘Wendy O Beaman.’ Wendy O Beaman agrees to perform the services specified to take care of Evelyn D Tulley’s pet in her absence. You need this document whenever you ask someone to take care of your pet. Some pets may require special care and handling. Perhaps your dog dislikes the mailman? Maybe your cat gets upset if his litter box is not cleaned regularly? Does your pet get along with other animals? Perhaps your aging cat has arthritis or your senior dog needs extra attention? A Pet Care Agreement provides Pet Owners and Pet Sitters a chance to share the little details so your pet receives the best care possible while you are away. If you’re looking for a pet sitter, try using DogVacay to locate a friendly pet caretaker, perhaps one who is even interested in helping with your dog’s geriatric needs. The new sharing economy also allows you to become a pet sitter on Rover. Disagreements could arise if the Pet Sitter or Pet Owner only use informal or verbal promises and something unexpected happens to the pet. If you are worried about your pet outliving you, name a future guardian for your pet in a Pet Protection Agreement and provide money to take care of your pet. Who is responsible if the pet accidentally gets sick or bites someone? The Pet Owner is usually responsible if the pet accidentally gets sick or bites someone when the Pet Sitter is not negligent or reckless. This document can answer difficult questions about who is legally responsible if something unexpected happens to the pet. For example, what happens if the pet accidentally passes away, gets sick, becomes injured, or is lost while the Pet Sitter is on duty? An indemnification clause can spell out these sticky details ahead of time. Both Pet Owners and Pet Sitters use an Agreement whenever a pet is being taken care of as part of a paid service. Who will be the Pet Sitter and who owns the pet? Where will the Pet Sitter take care of the pet? What will the Pet Owner pay for the Pet Sitter’s services? How should the Pet be fed and how often should the Pet be walked? Are you a landlord currently renting your property to a tenant? Make sure you have a Pet Addendum. 4. Emergencies: How or when the Pet Sitter should contact the Pet Owner or vet if the fit hits the shan, and the pet is in need of medical treatment.